Gremlins is a 1984 American comedy horror film directed by Joe Dante and released by Warner Bros. The film is about a young man who receives a strange creature called a mogwai as a pet, which then spawns other creatures who transform into small, destructive, evil monsters. This story was continued with a sequel, Gremlins 2: The New Batch, released in 1990. Unlike the lighter sequel, Gremlins opts for more black comedy, balanced against a Christmastime setting. Both films were the center of large merchandising campaigns. Steven Spielberg was the film's executive producer and the screenplay was written by Chris Columbus. 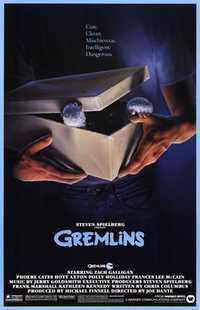 The film stars Zach Galligan and Phoebe Cates, with Howie Mandel providing the voice of Gizmo, the main mogwai character. Gremlins was a commercial success and received positive reviews from critics. However, the film was also heavily criticized for some of its more violent sequences. In response to this and to similar complaints about Indiana Jones and the Temple of Doom, Spielberg suggested that the Motion Picture Association of America (MPAA) alter its rating system, which it did within two months of the film's release. • Pink to Corey Feldman following 'Today' performance: "Know that you're loved"
This webpage uses material from the Wikipedia article "Gremlins" and is licensed under the GNU Free Documentation License. Reality TV World is not responsible for any errors or omissions the Wikipedia article may contain.